Back in the Fall we split the meat of a grass-fed Angus bull with three other families. We are just about out of beef, but one of things we had left was a brisket. My husband sat it out to thaw and was going to throw it on the grill. I had a better idea. One that require zero babysitting. Let’s pop it in the crockpot! I have no step by step photos but this really is super easy. You are going to want to use a 6 qt oval crockpot. Preferably one with a timer. Place the thawed brisket in the crock. Smother it with your favorite jar of BBQ sauce. I like to use a brand that has no high fructose corn syrup. Pop the lid on it and cook it on low for 12+ hours. Once it is done move it to warm until you are ready to serve. When you’re ready to serve it use two forks to shred it in the crockpot and stir it well into the remaining BBQ juices in the crock. 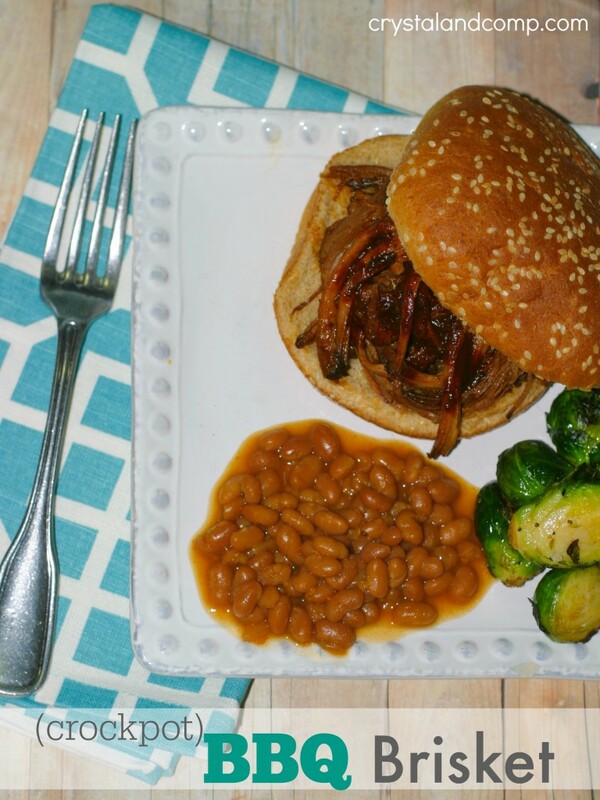 We served it on hamburger buns to make BBQ sandwiches. 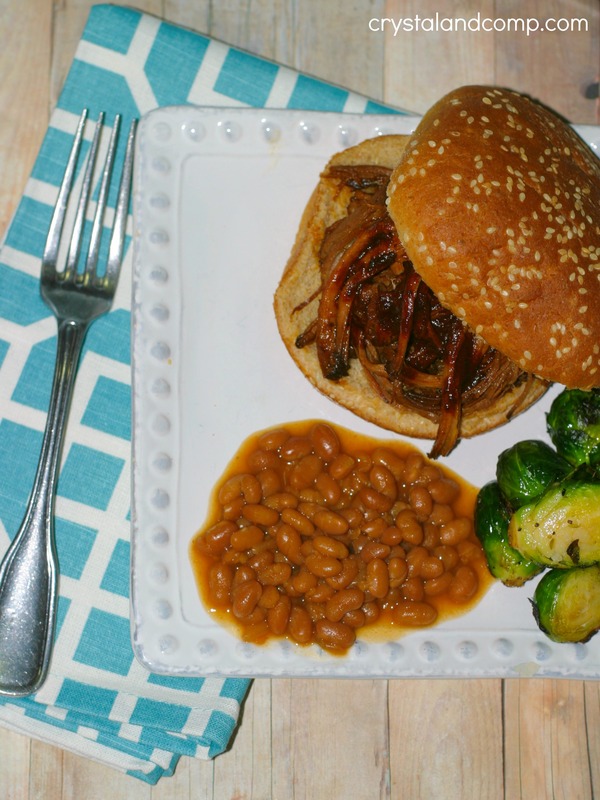 I also served it with Trader Joe’s baked beans and Brussels sprouts cooked in olive oil, salt, pepper and garlic. This also served well with fruit and chips. Freeze what is leftover for another meal down the road. The hubs would love this! Thanks for linking up to the Thoughtful Spot! we love brisket. I will have to make it very soon. Thanks for linking up at Tell Me About It Tuesday. We hope you hop over and share with us again next week. 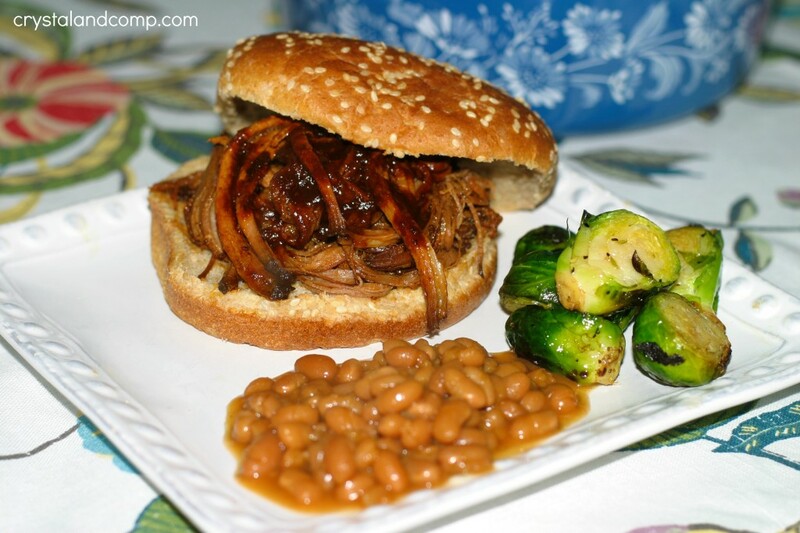 I just pinned your awesome BBQ Brisket! Thanks so much for sharing with Full Plate Thursday and have a great day!